NOTE: This story was taken from the blog of Foundations Health leader, Bob Speelman. Each week Bob works at one of his facilities in order to better learn what it means for Foundations Health to be "A Culture of Care." I spent the day at Brunswick Pointe Nursing & Rehabilitation Center, our brand new 90 bed all private room, a skilled nursing facility in Brunswick. Liz Verlinger is the Administrator at Brunswick Pointe and she is doing an outstanding job there. I had the privilege of working with Stephanie Eville, an STNA at Brunswick Pointe since July of this year. Stephanie, 28, has six children ranging from 11 to 1 ½ years old. Needless to say, Stephanie is a busy woman! After working a short time with Stephanie, you could tell she loved being a mom and she loved caring for people. Her interactions with the residents were so loving and kind. Stephanie said she became an STNA because she was considering becoming a nurse and wanted to get her feet wet and see if this was the field for her. I can say without a doubt it is! More and more I’m finding on this journey that the outstanding caregivers have a heart and a passion for Caring. They may have gotten into the field because they needed a job but they have not been staying because of that. They have stayed nursing assistants because they care. As we strive as a company to become a Culture of Care, we need more and more team members in every one of our departments that care and want to make a difference; a difference in activities, a difference by giving our residents a clean and safe environment to live, a difference in giving our resident great tasting food; these are the things that build the ultimate package of A Culture of Care. 5. Be the Reason. Be the Reason that resident smiled today, that nurse went home on time, the housekeeper had one less spill to clean up. Pretty powerful list! I’m excited where we are headed as a company and what we are striving to become as a Culture of Care. By working alongside team members like Stephanie, I know we are getting there! Happy Holidays from all of us here at Brunswick Pointe! 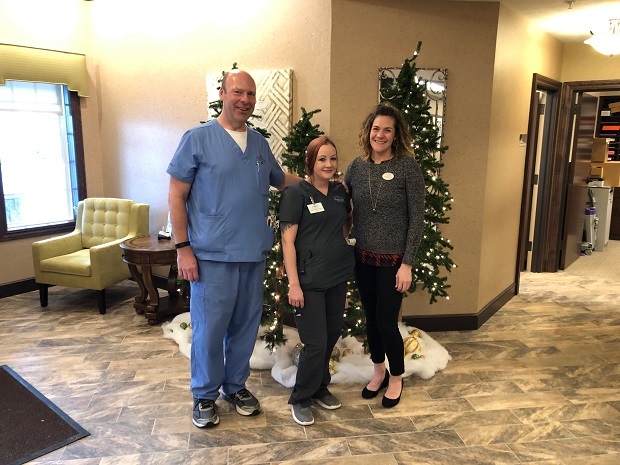 Foundations Health Solutions Leader, Bob Speelman, worked with Brunswick Pointe Nursing Assistant to learn how to better create a culture of care within the company. Check out this great opportunity! Join us to celebrate our one year anniversary! Presented & hosted by Brunswick Pointe & Bella Care Hospice! Join us for this informative event open to the public! Now Licensed and Accepting Medicare and Private Pay Patients! Come see if our beautiful home is right for you or your loved one!